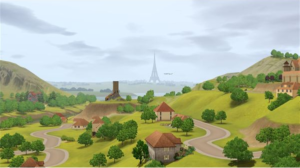 The Sims 3 offers a large amount of customization for Sim characters. Players are able to fully customize their Sim from their makeup, eye color, hair styles, hair color, clothing, accessories, and more. With the addition of The Sims 3: Ambitions expansion pack, this was heightened even more with the addition of tattoos to the game. Tattoos became available in the patch that came with The Sims 3: Ambitions expansion pack. After you install the game, there is the option to place a building for Barney’s Salon and Studio in your town, or you can build your own (the town of Twinbrook has Drea’s Salon and Tattoo). The salon is where you can take your character to get a tattoo. It is a fun place to visit, and has interestingly tattooed NPC Sims to give your Sim a new tattoo (that you can create). You could also buy one of the two tattoo chairs available: The Ink-in-Comfort 3000 or The Digital Tattoo Applicator. 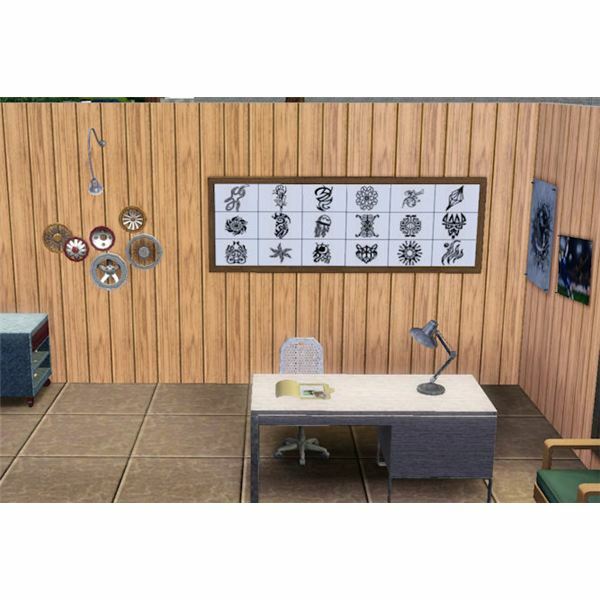 If you place these chairs in your Sim’s home, you can give tattoos to other Sims, or have one given to you. You select to get a tattoo by selecting the tattoo chair and opt to get a tattoo, or talk to the NPC tattoo artist and ask for a tattoo. When your Sim decides to get a tattoo, they strip down to their swimsuit (sorry, no naked sims!) and the animation shows them getting inked on their arm, no matter where the location of the tattoo is that you decided on. The Sims 3 tattoos available are able to be adjusted by scaling either really small or really large. Some are able to cover your Sim’s whole back even. The color can also be adjusted. Each tattoo comes with preset colors that you can stick with, or get creative with and change to any color you want. You are also able to change the opacity of the tattoo to make it lighter or vibrant and dark. The Sims 3 tattoos are able to be placed on your Sim’s ankle, chest, wrist, stomach, shoulder, bicep, forearm, back of the neck, full back, upper back, and lower back. Tattoos available from the game include: Half Moon, Stars, Sun, Hearts, WooHoo Heart, Gnome, Butterflies, Llama, Eagles, Bunny, Grim Reaper, Various Tribal Tattoos, Tribal Lettering, Angel Wings, Flowers, Partially Naked Lady, Goldfish, Sword, Scrolls, and more! If a Sim giving a tattoo is not skilled at giving tattoos, sometimes the results are quite funny, and the Sim receiving the tattoo will be less than pleased with the results. The game doesn’t include very many tattoos, but you are able to download more custom content ones to add to your game. Check out tattoos uploaded by other Sims players on The Exchange, or download some from Mod The Sims where you can find absolutely beautiful and cutting edge tattoos for a more realistic look. So, you think you want to be a tattoo artist? Your Sim has the ability to give tattoos, so why not make a career out of it? It is fun, especially for the Sims out there wanting to give ink to their fellow Sim neighbors. Don’t expect to get rich from Sims 3 tattoos though, the Sims 3 money cheat helps with that!